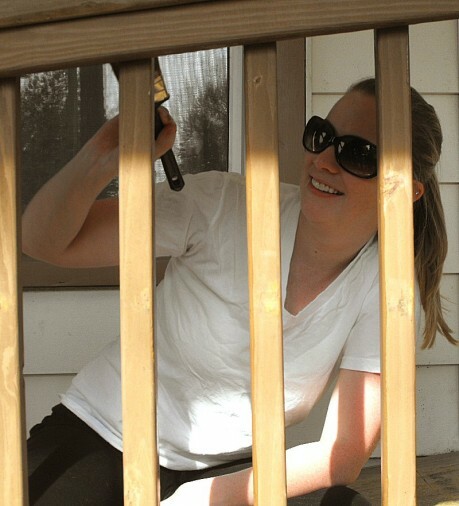 Jennifer Deeb paints the front railing at the Human Concerns Center. Just recently, one of those things was refurbishing and painting the porch and deck at the Oswego Human Concerns Center on East Fourth Street. AmeriCorps is a network of national service programs that meet critical needs in education, the environment, public safety, homeland security and other areas. Each year, AmeriCorps offers 75,000 opportunities for adults of all ages and backgrounds to serve through a network of partnerships with local and national nonprofit groups. â€œI think we’re at 39 members right now,â€ said Kathy Andolina, Oswego County AmeriCorps director. AmeriCorps workers were busy recently setting up displays at their sites in observance of AmeriCorps Week. 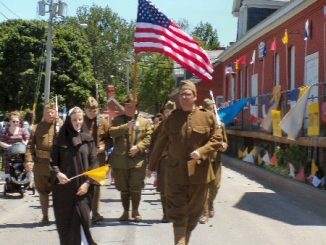 In Oswego, displays were set up at the Public Library, Leighton and Housing Visions (Hamilton Homes), Andolina said. They had tried to do the painting project at Human Concerns at week earlier, just before AmeriCorps Week started. However, the inclement weather forced them to postpone the work until the end of the week. Matthew MacVittie, was one of the nearly one dozen AmeriCorps workers who turned out to help at the Human Concerns Center. They were supposed to do it May 8 but it had rained too hard, she said. â€œSo, we switched it for today, which worked out great because more people could come,â€ Deeb added. They painted the inside last spring and it was time to touch up the exterior this year, she noted. 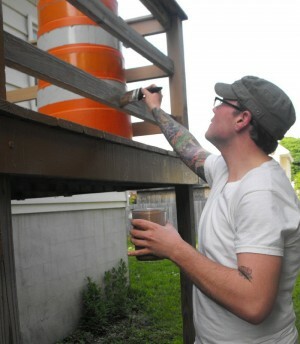 AmeriCorps worker Matthew MacVittie paints the ramp on the side of the Human Concerns Center. People in general have been wonderful in helping the center, whether itâ€™s money, food or work, she added. â€œWeâ€™re very lucky, very lucky with all the support we receive,â€ she said. The center received some additional funding through FEMA through the United Way this year. That has helped with the increased demand for services. The Food Bank has also been very generous, she said. In Fulton, AmeriCorps members with Catholic Charities of Oswego Countyâ€™s CYO Program, Paul Burgess and Teresa Litchison, helped celebrate AmeriCorps Week with a special project relating to their worksite. 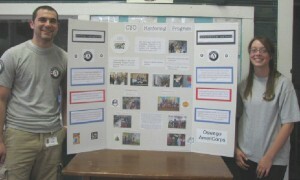 AmeriCorps members throughout the county created tri-fold display boards that contained detailed information on their worksite, the responsibilities of their position, and the Oswego County AmeriCorps program. Their display highlighted the many programs and activities offered through the CYO Programs and showcased the variety of responsibilities they have as they work with students at the CYO. AmeriCorps workers Paul Burgess and Teresa Litchison with Catholic Charitiesâ€™ CYO Program, stand by their display board that they created as part of AmeriCorps Week. CYO director Jim Smiley praised the two for their work on the project and their dedication to the CYO. The Oswego AmeriCorps program serves county youth by providing mentoring, out of school activities and management of volunteers who work with youth. For additional information, visit www.americorps.org or call Andolina at 349-3451.